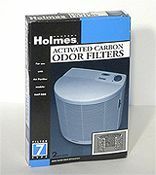 Holmes HAPF96 Carbon Filter is a Genuine OEM Holmes Filter. HAPF96 Carbon Filter fits HAP560, HAP561, HAP570. Holmes HAPF96 Carbon Filter traps over 4000 chemicals and noxious odors. Filter Dimensions, inch. 17.7 x 9.0 x 0.2. Filter lifetime: 3 months on average (under normal residential conditions). Holmes HAPF96 Carbon Filter comes 2 filters per pack. Save up to 50% on Delivery Charges* when Order a Master Pack of 4 Carbon Filters HAPF96. HAPF96 x 4 Holmes HAPF96 Carbon Filter. Holmes HAP56 HEPA Filter complements Holmes HAPF96 Carbon Filter.